Eliminate downtime and costly filter changes with Ruwac's line of pre-separators. 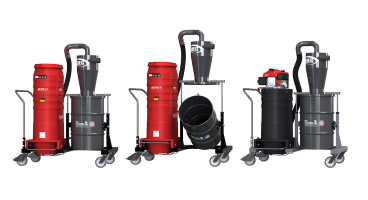 For applications where vacuum cleaner filters may clog prematurely, the use of Ruwac's high efficiency cyclones or a drum separator is a necessity. 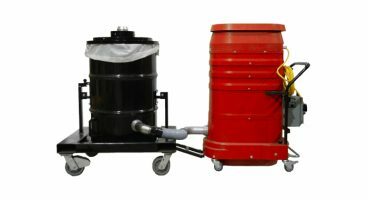 Whether it be for a new or an existing industrial vacuum system, these pre-separators and drum systems will collect debris prior to reaching the filter. The use of one of Ruwac’s bulk recovery drums separator with your Ruwac vacuum system is your alternative to collecting bulk materials, liquids, and large quantities of dust and debris that can compact inside of a traditional industrial vacuum filter system. 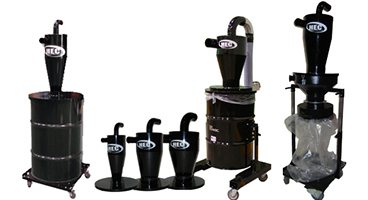 The High Efficiency Cyclone (HEC) by Ruwac is an exclusive pre-separator for fine dust collection that attaches between any Ruwac vacuum and above a drum or direct bagging system. These systems are 95(+)% efficient with submicron particles, and thus, eliminate filter clogs, increase filter life and a vacuum's collection capacity. Each HEC system is available in three different sizes customized to work with a wide range of CFM ranges and inlet sizes. 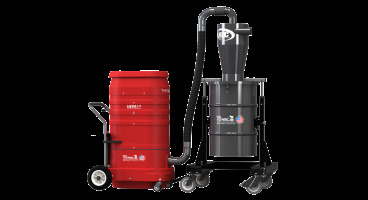 The power and performance of the vacuum paired with the efficiency of the pre-separator, all on one convenient frame. The pairing of the 12" high efficiency cyclone (HEC) increases the efficiency by 95% and separates heavy material before entering the vacuum, further increasing filter life!